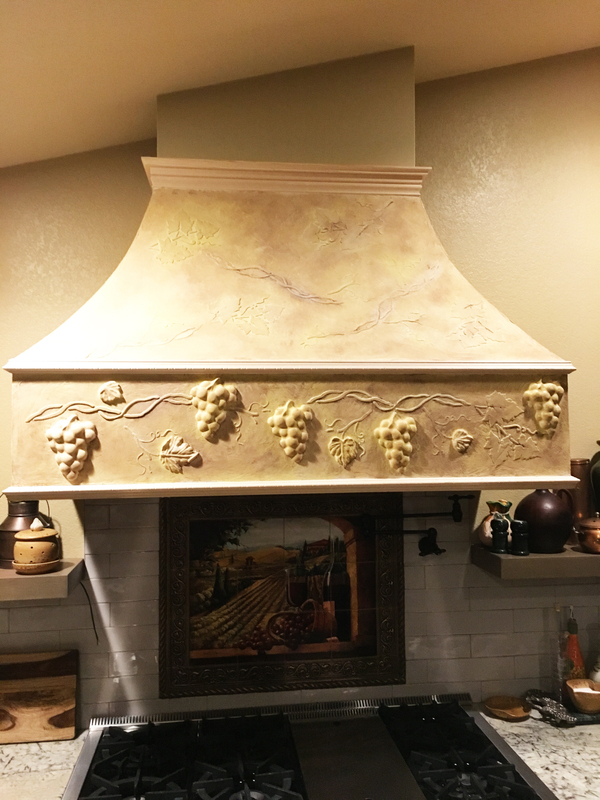 Natalia Baldo just knew there was something she could do with her plain range hood and she found the perfect thing with our Raised Plaster Grapevine and Mold Stencil Set. This is a stencil and mold “set”. The stencil includes vines and leaves, the plaster mold includes the grapes and leaves. Use the stencil with joint compound or other dimensional product, and use the mold with plaster of paris for super dimensional grapes and leaves. We send super easy instructions. Natalia chose not to use the leaves on the stencil, but rather use only the leaves from the plaster mold. 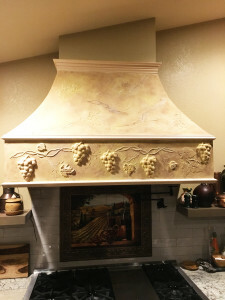 The final look is just beautiful and adds such dimension to the range hood. Lovely job! This would also make a super exciting border all around the kitchen on the wall, either using it as a border against the ceiling, or draping over and down a doorway.